“Go to the edge!” It’s a promotional slogan that promises, and importantly delivers. 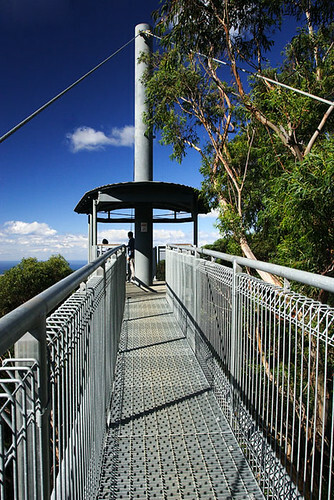 The touristy Illawarra Fly Tree Top Walk is one of four steel tree top walks in the world – all of which are in Australia. The others are in the Otway Ranges VIC, Tahune State Forest TAS, and the Walpole-Nornalup National Park WA. 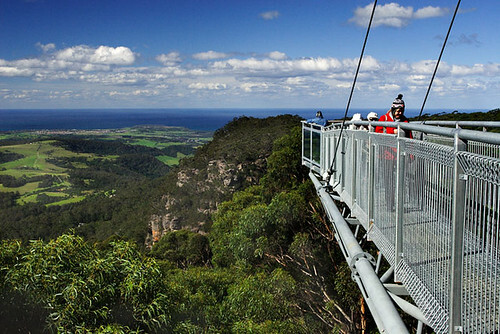 Amongst the trees of the Illawarra Escarpment, the view over the fertile hinterland and curving coastline is stunning. The refreshing vista inspires freedom – just like a bird. 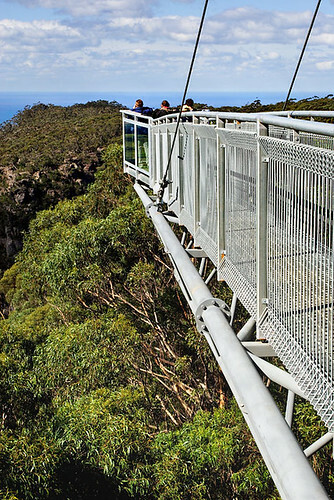 With two cantilevers hanging above the trees, visitors experience exhilaration or nervousness. 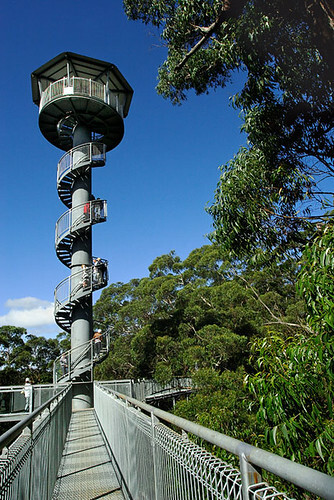 The narrow spiral staircase to the top of Knights Tower reaches the highest point of the Illawarra Fly, and at 45 metres up, one can feel the breeze and witness the panoramic view. See the glistening waters of Lake Illawarra, look towards Port Kembla, and gaze at delightful Shellharbour. Tower 9 is the base for a cantilever that is suspended 26 metres up. The views of steep rocky slopes, forested areas, and the golden sandy coastline are spectacular. The gentle motion of the cantilever either excites or frights, but for most it’s the former. Kids, and kids at heart, can be seen with a smile as they experience the moderate swaying. Tower 9 cantilever. Go to the edge! Signs advise visitors to refrain from running on the see-through walkways, however during my visit the excitement inevitably bubbled over amongst the younger brigade. The walkways are no place to go rummaging through the loose change pocket either. If you pull out coins here, you’ll risk losing them to forest floor. The eco-friendly visitor centre consists a café`, retail outlet selling quality souvenirs, visitor information, and toilets. Light meals are available, with the café` providing prompt service and comfortable modern facilities. A large outdoor paved dining area gives visitors opportunity to breathe in the fresh forest air whilst sipping on a latte` or enjoying a Devonshire tea. 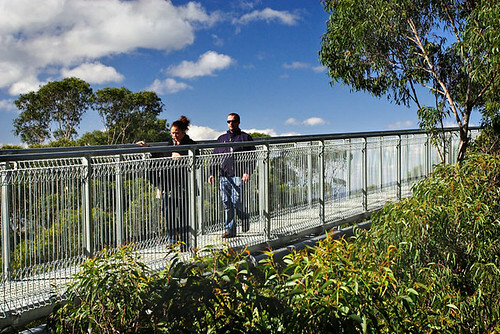 Upon leaving the visitor centre, meander along the track through the forest and enjoy designated points of interest. Take a peek at Wombat Junction and check to see if the local resident is in the burrow. A little further along the track is The Black Stump. The cause of the stump being black is due to it being struck by a bolt of lightning many years ago, apparently. With the 500 metre long structure supported by 10 towers, there’s minimal impact on the surrounding environment which consists warm temperate rainforest and tree ferns with decorative fronds. Also, keep the peepers wide open for bird species including: Yellow-tailed Black-Cockatoo, Crimson Rosella, Laughing Kookaburra, Powerful Owl and Eastern Whipbird. Of course there’s always one show-off who will do something out of the box. During my visit, I witnessed a middle-aged man climb onto the railing at the end of the Tower 9 cantilever. Onlookers gasped in amazement, and his wife and children were not impressed. 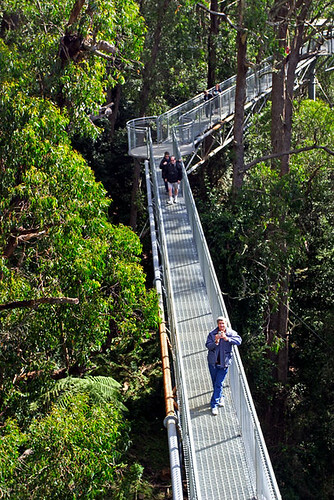 The tree top walk took six months to construct, and was completed in February 2008. A team of six assembled and erected the structure on site, and each span between the ten support towers is 40 metres long. A shuttle bus – which looks like an elongated golf cart – is available for those requiring assistance. But, if you’re fit as a fiddle and desire a ride, just holler and state your case. Sure saves walking up the gently sloping hill. What a thrill! 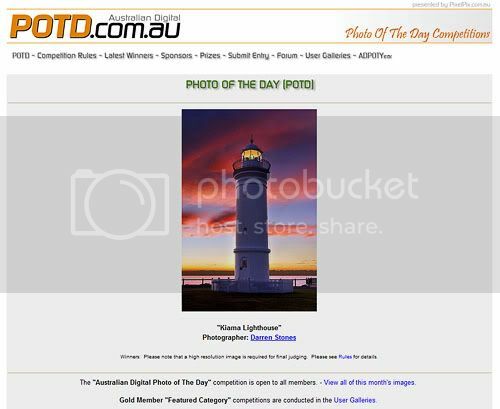 My photograph of the Kiama Lighthouse has been chosen as the ADPOTD Photo Of The Day for Monday July 6 2009. Russell Stewart, owner of ADPOTD, selects one photo as the Photo Of Day each weekday - except during December. At the end of the month, a Photo Of The Month (POTM) is selected and that image is published in Camera magazine and its owner receives a prize of a ThumbsPlus 7 - Today's superior graphics management tool. The POTM is then eligible for the Photo Of The Year (POTY).